First introduced by Volvo in 2011, the 9700 model is popular in both the United States and Europe. This vehicle is unique in the market due to a vertically integrated manufacturing process. A stylish trim and design set this vehicle apart from other charter buses currently on the market. Most models come standard with all the above features. If you are interested in learning more about specific features in the Volvo 9700 model please contact a reservation specialist. Agents are available 24/7 at 1-800-436-8719. For long trips on this vehicle, having a modern audio and video system is very important to make the trip more pleasant. 15" monitors are optional on all vehicles. Audio systems come standard, but Hi-Fi upgrades are also available. Power outlets under the seats can be used to charge laptops for those who brought their own entertainment aboard. Volvo touts the fuel efficiency of their vehicles and environmentally friendly engine designs. Reducing the weight of these vehicles has been carefully thought through by the manufacturer to make the bus as efficient as possible. What this results in is lower prices for the consumer and a better footprint on the environment. As a rule of thumb, traveling by motor coach is always more green than taking a private vehicle for longer trips. The National Park Touring across the country to National Parks and Wildlife Preservations can be accomplished by charter bus. The Volvo 9700 is ideal for large groups of up to 55 passenger who will be on the road long distances. Customers are constantly requesting these buses to tours of Yosemite in California and Yellowstone in Wyoming. 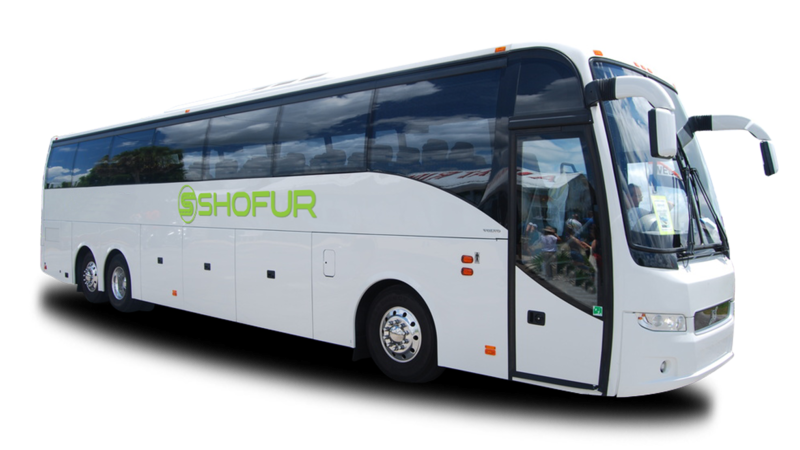 To receive a free quote and book your next trip contact Shofur today. The Music Festival: There is no shortage of musical festivals attracting millennials across the country this year. Electric Daisy Carnival is a two-day EDM music festival that takes place in Las Vegas. Lollapalooza takes place in Grant Park, Chicago during the month of July and attracts people from across the country. Charter a bus to these music festivals today and don't miss a beat! About the Manufacturer The Volvo 9700 is manufactured by Volvo Buses, a subsidiary of the Swedish automaker. The company sells vehicles globally, with a strong presence in European, North American, and Asian markets. In South America, the company markets to Argentina and Brazil. For more information on specific models and features visit www.volvobuses.com.